It is all about the topping. I love crumb cake. I am pretty sure it has to do with the fact that my mom would make it when I was little. It also fits quite nicely with my love of cinnamon. This crumb cake is not just an ordinary crumb cake, because it is a New York Style Crumb Cake. 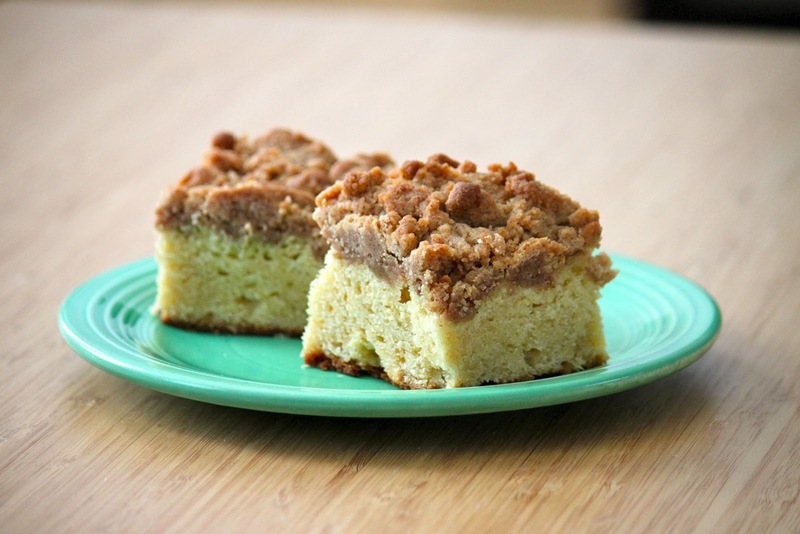 Anybody of you from New York or the northeast will know, that to be a a New York crumb cake there needs to be significant crumb topping. In fact, this cake may be a little shy on the topping for some real New Yorkers. I am sure if you tasted it though, you would forgive the fact that the crumb topping should probably have been a little thickener because this cake is delicious! Preheat oven to 350 degrees Fahrenheit. Spray a 9x13 baking pan with cooking spray. 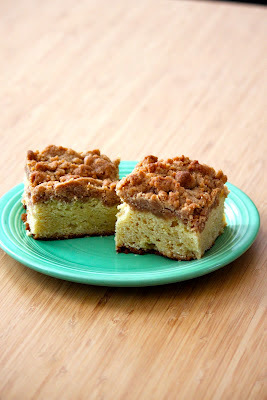 To make the crumb topping: Whisk the flour, brown sugar, granulated sugar, salt and cinnamon together in a large bowl. Add the melted butter and whisk to combine. Use a rubber spatula to fold in the flour. To make the cake: In a medium bowl, whisk together the flour, baking powder, baking soda, and salt. In the bowl of a stand mixer fitted with the paddle attachment, cream the butter and sugar together on medium speed until light and fluffy, about 2-3 minutes. Beat in the eggs, one at a time, letting the first incorporate fully before adding the second. Scrape down the sides of the bowl and beat for an additional 30 seconds. Add the sour cream and vanilla to the mixer and beat until just incorporated. Finally, add the flour mixture in thirds, beating just until combined. Transfer the batter to the prepared baking pan. The batter will be thick, use a spatula to spread it evenly. Pick up the crumb topping by handfuls, and break off chunks, scattering them over the top of the batter. Use all of the topping. Bake for 45-55 minutes (rotating the pan at 15 minute intervals), or until a toothpick inserted in the center of the cake comes out clean. Let the cake cool in the pan for at least 30 minutes before serving. p.s. Happy Father's Day Dad and Happy Father to-be Day Zack. I love you guys! Oh my this looks soo delicious. Im gonna have to make this this week.